Welcome to Dongpai online store! We believe that Everyone can be a Queen/Princess if we select appropriate clothing for ourselves. 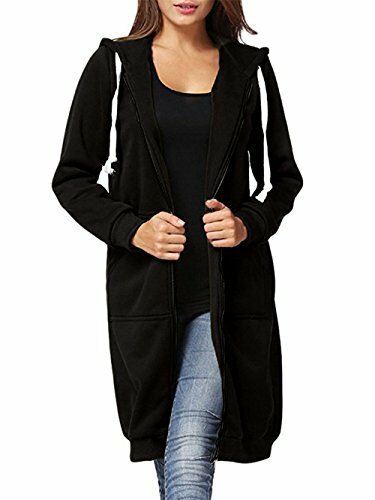 Simple Hoodie will never be out of fashion and they are easy to match with other kinds of clothing. S: Bust 96cm/37.44" ---------- Sleeve Length 57cm/22.23" ---------- Length 89cm/34.71"
M: Bust 100cm/39.00" ---------- Sleeve Length 58cm/22.62" ---------- Length 90cm/35.10"
L: Bust 104cm/40.56" ---------- Sleeve Length 59cm/23.01" ---------- Length 91cm/35.49"
XL: Bust 108cm/42.12" ---------- Sleeve Length 60cm/23.40" ---------- Length 92cm/35.88"
2XL: Bust 112cm/43.68" ---------- Sleeve Length 611cm/23.79" ---------- Length 93cm/36.27"
3XL: Bust 116cm/45.24" ---------- Sleeve Length 62cm/24.18" ---------- Length 94cm/36.66"
4XL: Bust 120cm/46.80" ---------- Sleeve Length 63cm/24.57" ---------- Length 95cm/37.05"
5XL: Bust 124cm/48.36" ---------- Sleeve Length 64cm/24.96" ---------- Length 96cm/37.44"
2. The color of actual item may look slightly different from the pictures because of different computer setting, hope you can understand it. 3. If you are satisfied with your purchase, we appreciate that you could write review or feedback for our product and service. Thank you so much. If you have any questions about this product by Dongpai, contact us by completing and submitting the form below. If you are looking for a specif part number, please include it with your message.